Jo Vermeulen, Jonathan Slenders, Kris Luyten, and Karin Coninx. In the Proceedings of AmI '09, the Third European Conference on Ambient Intelligence, Salzburg, Austria, November 18th - 21st, 2009. Springer Lecture Notes in Computer Science 5859, ISSN:0302-9743, ISBN:978-3-642-05407-5, pp. 196-205. The design ideal of the invisible computer, prevalent in the vision of ambient intelligence (AmI), has led to a number of interaction challenges. The complex nature of AmI environments together with limited feedback and insufficient means to override the system can result in users who feel frustrated and out of control. In this paper, we explore the potential of visualizing the system state to improve user understanding. 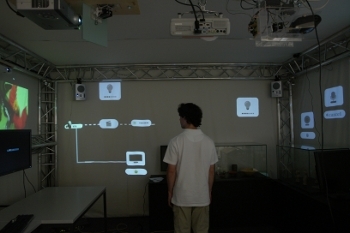 We use projectors to overlay the environment with a graphical representation that connects sensors and devices with the actions they trigger and the effects those actions produce. We also provided users with a simple voice-controlled command to cancel the last action. A small first-use study suggested that our technique could indeed improve understanding and support users in forming a reliable mental model.